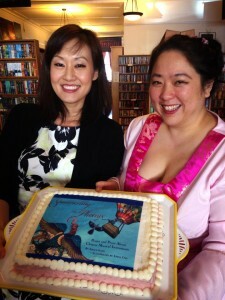 I am so grateful to the wonderful staff at Borderlands Books & Cafe In San Francisco for hosting my first book party for Summoning the Phoenix! 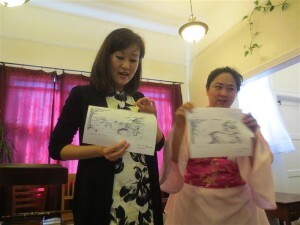 Not only did they volunteer to host a book event, but they also proactively invited my book’s illustrator April Chu to have her very own art show displayed in the cafe! 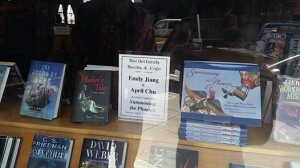 Above is a photo of the Borderlands Books window display taken by Jessica Dolcourt, an old friend I hadn’t seen in person in years. This photo was the first of a number of wonderful unexpected gifts that day. I’m grateful for the unplanned awesomeness that happened to me during the day of the party: Meeting up spontaneously with the soulful, fun Sophia who had traveled from LA and who actually had time in her packed schedule to come to my party! April’s brilliant idea of “Summoning the Phoenix” wine! Raffle prizes out of my backpack! 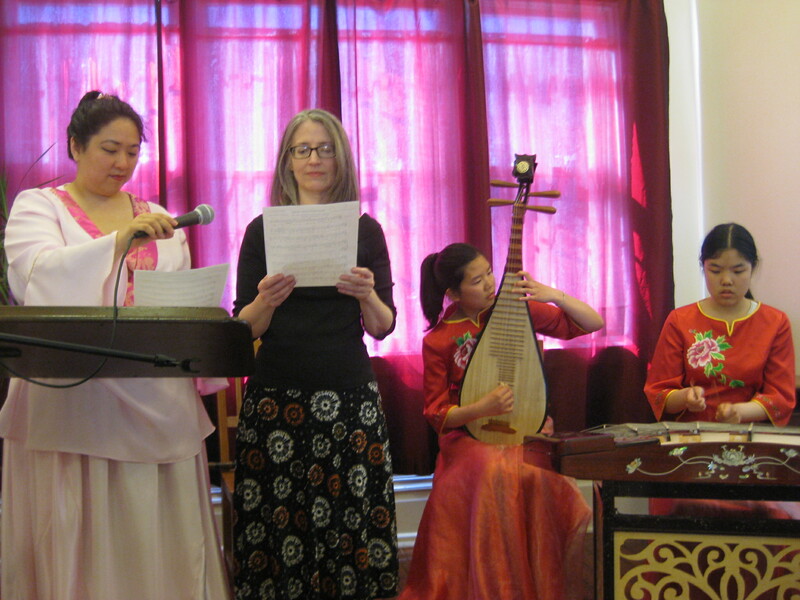 Singing Jasmine Flower Song in Mandarin for the first time in public with Mary & having beautiful instrumental backup! 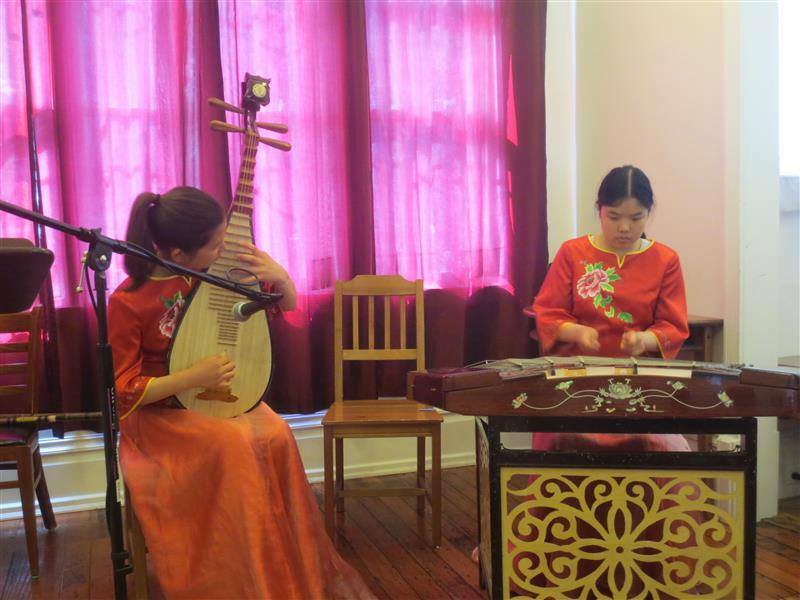 Below are me singing with Mary Tusa with Christine playing the pipa and Ellen playing the yanqin. but I’d never pluck you. 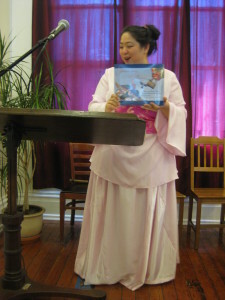 We had a very warm and kind and patient audience. With set up and such, we began about 15 minutes late, which was fine, since it gave people time to arrive, eat at the cafe, and settle. We started with a very nicely intimate 10 or so (which was exactly the amount who RSVP’ed to my book party – yay!) then quickly expanded to fill the corner of the cafe with at least 40 folks in the end. People just kept trickling in, and we ran out of chairs (again I was expecting 10, maybe 15 people max). While April spoke, I quickly arranged more chairs for her family, who walked all the way from the BART station to Borderlands. And there was an awesome cake. Because the list of my friends who showed up was actually containable within my head, here’s a long list of thank yous. 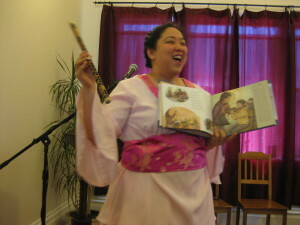 Thanks to the fantastic Borderlands staff who worked hard on the day of my book party: Alan, Jude, Jeremy, Devony, Z’ev. Thanks to my new musician friends Christine & Ellen and their father Mike, who drove them over an hour one-way and let them miss their symphony rehearsal so that they could play beautiful music at my first book party. 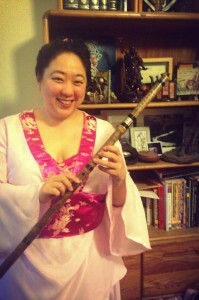 Thank you to Duny of the wonderful California Youth Chinese Symphony for recommending them to me. 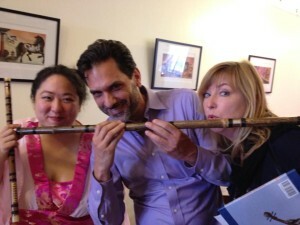 Christine & Ellen, are so talented and I wish you all the best! (photo below by Sunil Patel) Thanks to my friends who went out of their way to make my party more awesome: Mary (for custom cake & beautiful song), Sophia (for helping with my hair and for spontaneous camcorder awesomeness), Kate (kindly buying last-minute earplugs for one of the musicians), Sunil (keeper of my not-so-awesome extra camera), new friend Toby (bartender & pusher of books), and Anna (who designed and made my very PINK costume inspired by the Tang Dynasty). (Photo below by Sophia Chang) Thanks to my friends who rushed from rehearsal and in-between events and who I know were subjected to great stress to make it to my party: Megan, Na’amen, Carrie, Eithne, Ciara, & Ciara’s guy. Thanks to my friends for your wonderfully warm presence: Jim, Kristin, & Kristin’s mom; Steven & Linda; Christian, Jennifer & Kennard; Aaron & Maria; Chris, perhaps my newest friend, who I could tell knew all about Chinese music; and Kelly, the one at Borderlands who has known me the longest. Below is a photo of me with author friends Jim Averbeck and Kristin Elizabeth Clark attempting to play the xiao, photo taken by Kristin’s awesome mom. Thank you, April’s friends & family, for your fabulously positive energy and to random woman who kindly offered me a strawberry right before my book party. Thanks to everyone I know who has worked at Shen’s and Lee & Low and helped me on my book: Renee, Louise, Hannah, Keilin, Amanda, Alyssa, John, Randy, and Lee & Low co-founder Craig. Thank you, dear friends, who actively reached out to me within 24 hours before my party, wished me luck, and posted pictures of my book, all acts of kindness that helped add to my pre-party excitement and assuage my pre-party nervousness: Jessica, Erin, Dora, Mike, Mike, Andy, Fran, Fran, Shan, Linda Joy, Linda, Valerie, Andrea, Kevin, Nick, Zak, Deirdre, Ilene, Bea, Cassandra, Vicky, Rita, Dana, Dana, Debbi, Kris, Christine, Mallika, and finally Shweta & Nathaniel, who live in Scotland & ordered their books through Borderlands to be personally inscribed and autographed by me and by April. 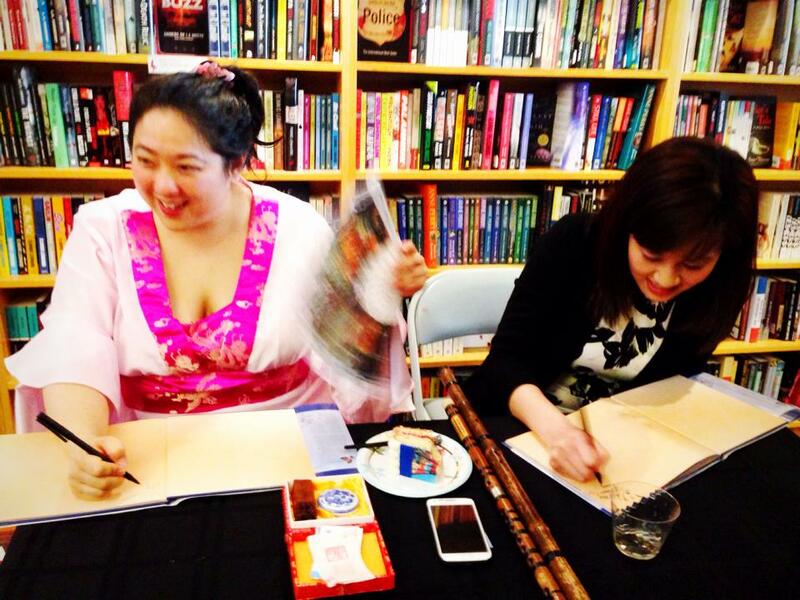 FYI, I autograph all my books with a Chinese chop that I had personally designed and hand-carved while I was in Beijing, China. (photo below by Megan Kurashige) And finally, thank you, Seanan McGuire, whose fabulously fun book events opened my eyes to the possibility that a book launch can truly be a PARTY. 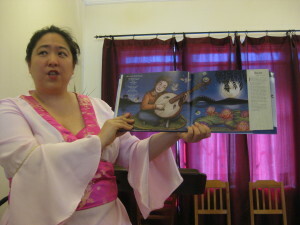 (photo below by Sophia Chang) I’m so grateful that my party at Borderlands was a wonderful experience. But it’s not over yet! There are still THREE more parties in the San Francisco Bay Area with LIVE MUSIC, FREE raffle, FREE crafts for kids. Join us as we continue the Party Around the San Francisco Bay! ***Don’t use Facebook? RVSP using the form on my home page. 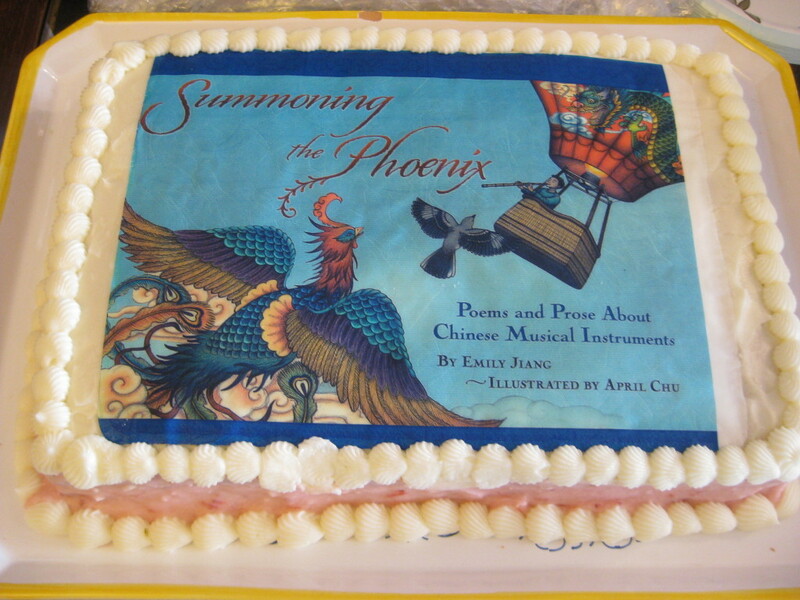 And for those of you who cannot make it to my party yet still want to buy SUMMONING THE PHOENIX and get it inscribed or personalized (like To Mary) and autographed by me and by April, Borderlands Books has a free service where they are happy to obtain those personalized signatures and mail them to you! Thank you, everyone, for your well wishes!